"Thy Kingdom Come, The Second Coming"
Things that start with S and end with Y... Saturday and Society! Yeah, that's pretty weak... but let's read some JSA anyway. We pick up with Flashes Wally and Jay getting ready to hop on the Cosmic Treadmill to use it to cross into another dimension. 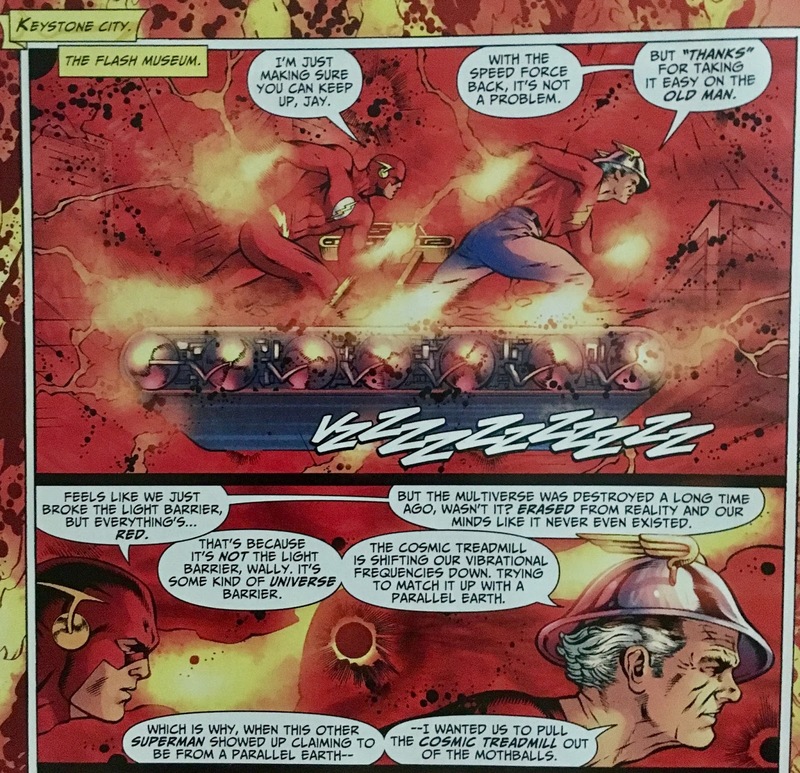 Wally is confused, thinking that the Multiverse was erased... and, even now, it's weird to read that the characters actually know that that happened. Anyhoo, they manage to cross into Universe 2--, which perhaps we can assume to be Universe-22 (home of the Kingdom Come Earth), the Treadmill begins to break apart and they find themselves surrounded in complete blackness. They reverse course and return to the Flash Museum before the Treadmill goes to pieces. 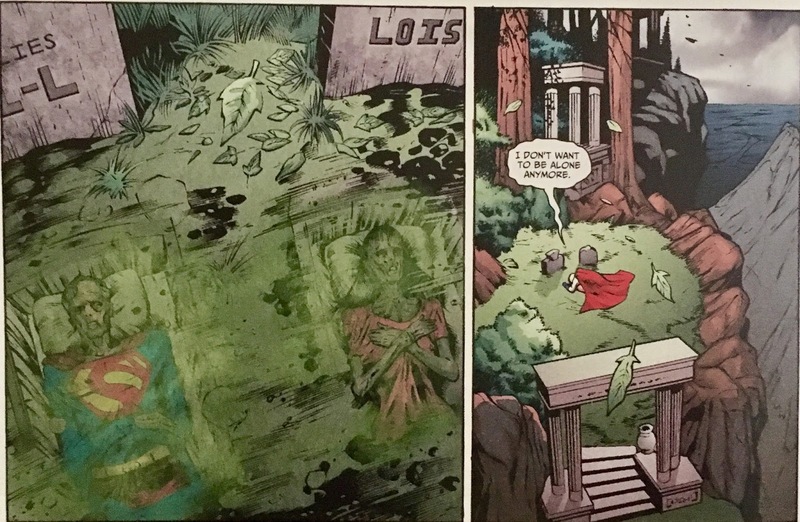 Alan Scott turns to Superman (our Superman) to get his opinion... He says he's definitely telling the truth. He doesn't even need to analyze him... he just knows. Unfortunately, the Supermen don't get any one-on-one time. 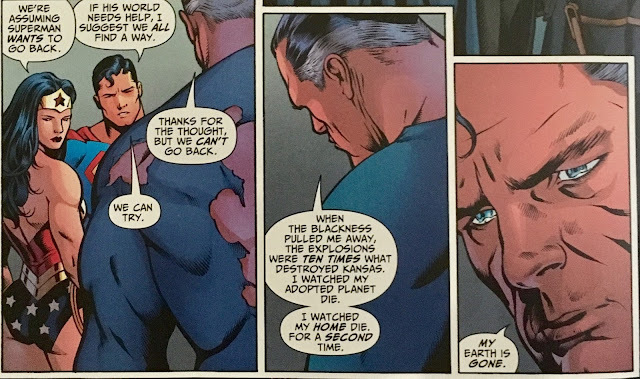 KC Superman appreciates that, and comments that this Justice Society learns from mistakes, just as Obsidian told him last issue. 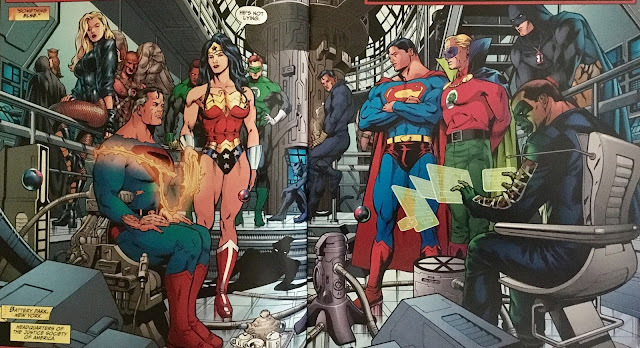 The Hawks and Dr. Mid-Nite talk off to the side, and observe how the last time a grey-haired Superman showed up, he damned them... while this one blesses them! The compare it to the "Second Coming", which Mr. Terrific poo-poos with the quickness, as he's Atheist and likely doesn't want confounding variables of faith included in his data, which is fair enough. Obsidian pops his head in to suggest he respect the beliefs of others. Finally, Batman pipes up... (about time, right?) and says that their next task is to find a way to send this Superman back home. 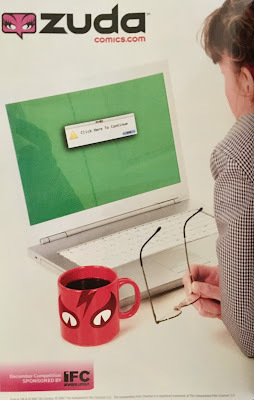 He turns to Starman, suggesting that the black hole he opened in the paint factory also acted as a wormhole... and if it could go one way, it ought to be able to go the other. Starman says he'd need a Map of the Multiverse to accomplish something like that. 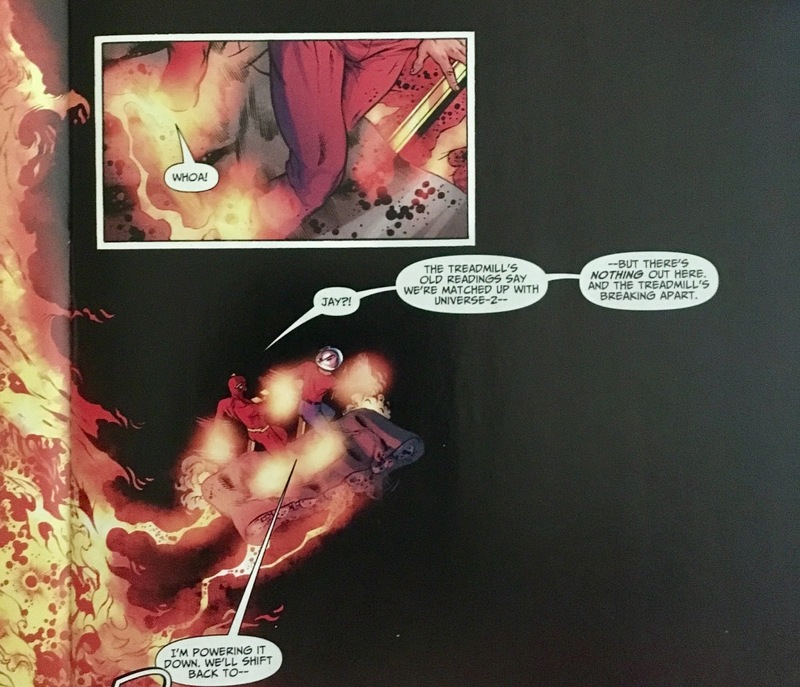 Wonder Woman asks the question... does KC Superman even want to return to Earth-22? Well, turns out... it's moot. KC Superman informs the heroes that his Earth is gone. We shift scenes to join Power Girl. If you guessed she'll be sitting at Kal-L's grave... you've been paying attention! In a neat bit, she uses her x-ray vision to peer into the graves... where she sees the bodies of her cousin and his wife. 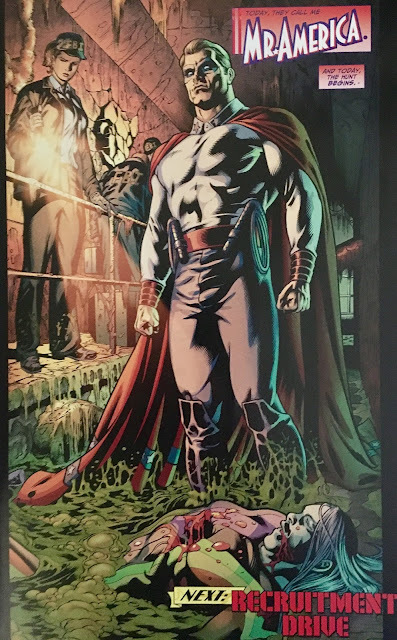 I suppose that's proof positive that this other grey-haired Superman is definitely not Kal-L.
We jump ahead to the Justice Society flying over New York City. We also see KC Superman standing in the crowd below. A brief flashback shows Maxine and Courtney presenting him with his mended Superman costume... which is really fun. In just two panels, Johns was able to show us the difference between Maxine and Courtney insofar as comfort level around supers. 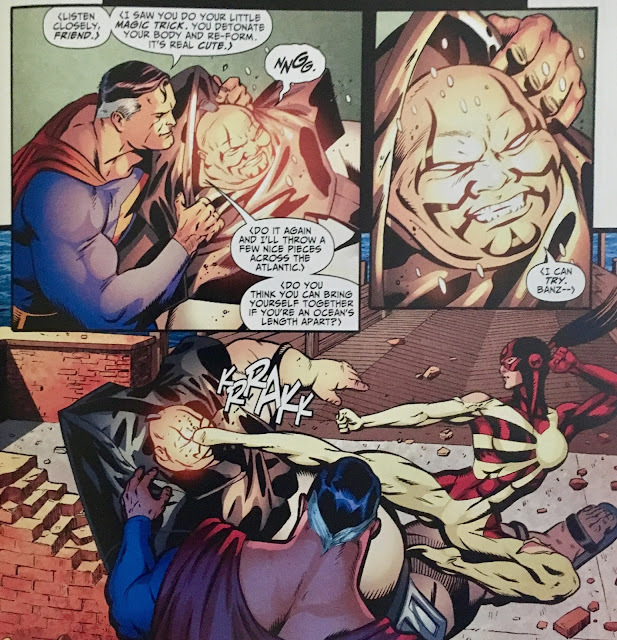 Superman overhears some hub-bub over on Ellis Island, and knows this is a job for... well, him! Over on Ellis Island, we meet Judomaster (Sonia Sato) as she fights off some Eastern-themed supervillains, Seppuku, Kamikaze, and Kung the Obake. Green Lantern asks if Ms. Sato is any relation to the original (Charlton Comics) Judomaster, Rip Jagger. Thankfully, she's not! However, Jagger's old sidekick Tiger is the leader of this crew of baddies. As the battle rages, Mr. Terrific explains that she has the power to... not get hit, which is convenient. Unfortunately for her, there is a loophole. 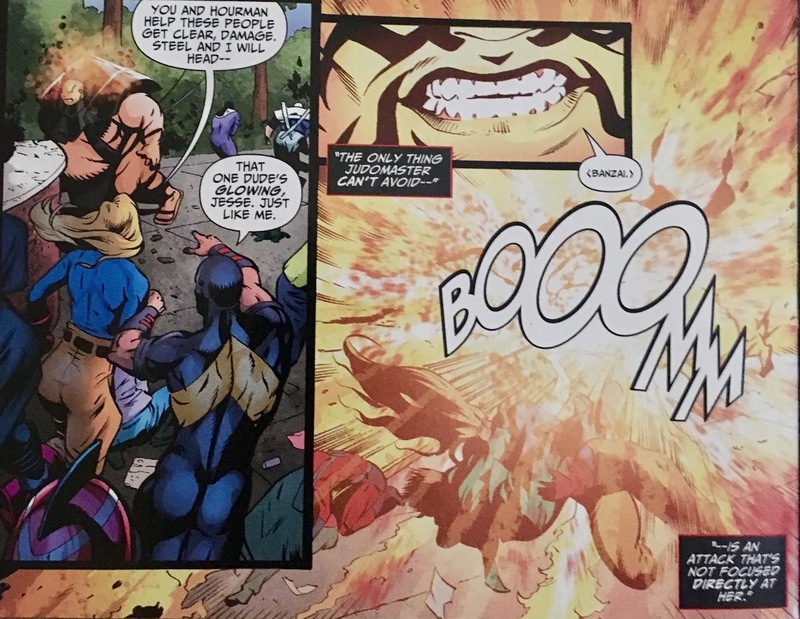 While she cannot be attacked head-on, she can take damage from an attack that isn't directly at her... case in point, the sumo-sized Kamikaze exploding himself! It looks like Kamikaze's power is to explode his upper half, then reforming to do it all again... which is exactly what he decides to do! That is, of course, until Superman arrives and threatens to throw chunks of Kamikaze all across the globe. In the distraction, Judomaster lands a well-placed kick. As the dust settles, the authorities arrive with the intentions of arresting Judomaster. Damage pipes up and tries to get the officers to back off. Hourman and Liberty Belle are proud of "their boy". 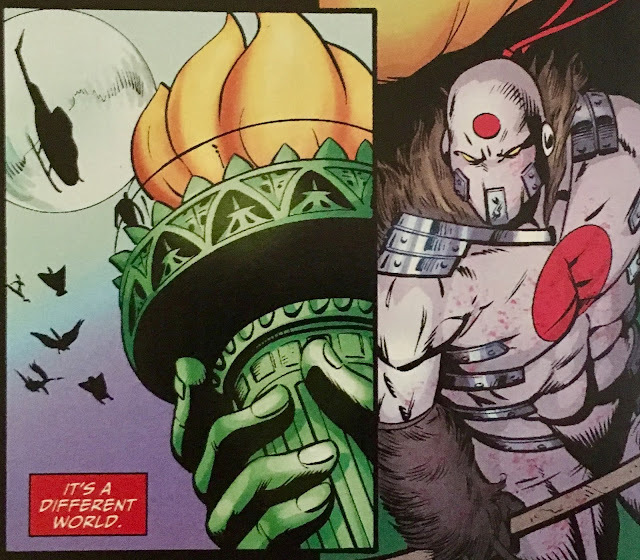 As the Justice Society leaves, we can see that Tiger has watched the entire event unfold from the torch of the Statue of Liberty. Back at the brownstone, Superman approaches Power Girl to try and iron things out. He knows that she's uncomfortable with his presence, but vows that he will do whatever he can to make it so they are as close to being a "family" as possible. Kara looks incredibly touched... I mean, this is just a beautiful panel. 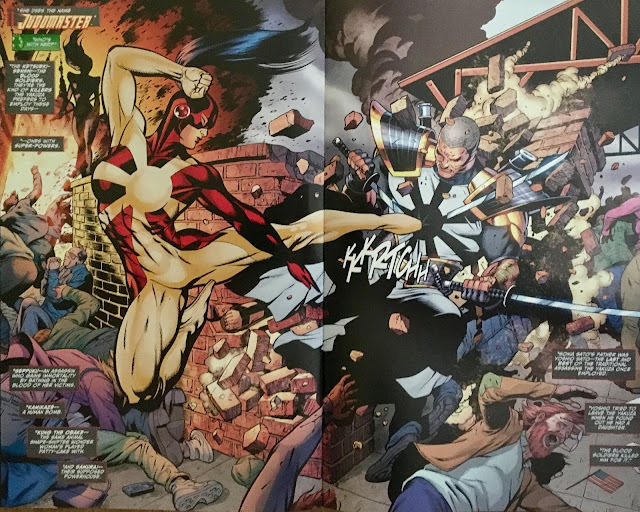 I give Eaglesham a ton of credit on his excellent two-page spreads, but ho-lee cow, this is a gorgeous Power Girl. You know exactly what she's thinking and feeling... it's just amazing. 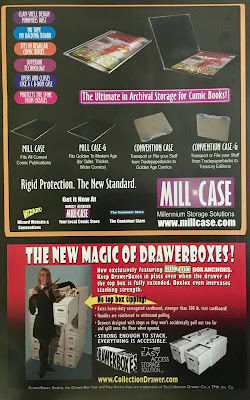 We wrap up picking up another thread from last issue. We're in the sewers where "God of Crayola" Chroma was killed. The FBI are out in full-effect, alongside a special helper... Mr. America?! Another really good issue of Justice Society... though, I gotta say I was a little bit let down. When last issue's "next issue blurb" promised Superman meeting Superman, I was hopeful that we'd get a bit of a chat. 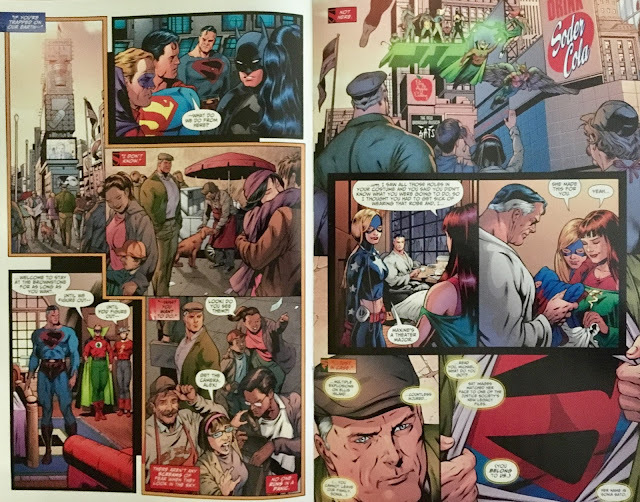 We don't get a single scene of the two paired off, and (our) Superman only gets like two lines of dialogue. That bummed me out. Seems like such a missed opportunity... though, to be fair, I haven't read this since it hit shelves, and there may yet be a conversation between the two yet to come. I dig seeing Judomaster, as post-Crisis the original (and Tiger) showed up in the All-Star Squadron. 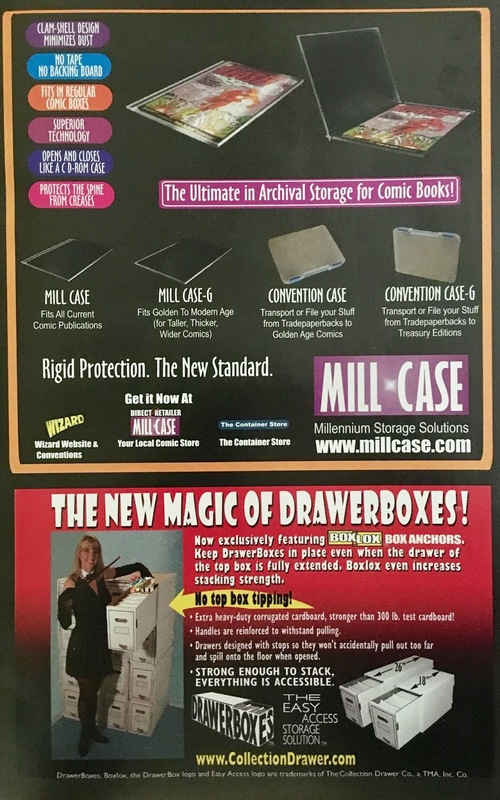 Makes sense that this character would gravitate toward the JSA. I haven't finished my All-Star read-through, so I'm unsure if the Tiger heel-turn happened there, or if this is actually in reference to that unforgettable The L.A.W. : Living Assault Weapons miniseries... nah, couldn't be. I've mentioned a couple of times already how much I appreciate Maxine being treated like the newbie that she is. I love that she gets flustered in front of Superman... I mean, who wouldn't, right? I also like that hanging around supers is old-hat to veteran Courtney Whitmore. Neat little two-panel scene that shows us so much of both of their personalities without being overblown or "precious" about it. Speaking of short bits that say so much... Mr. Terrific telling Hawkman and Hawkgirl to leave religion out of their postulation makes perfect sense without being condescending. 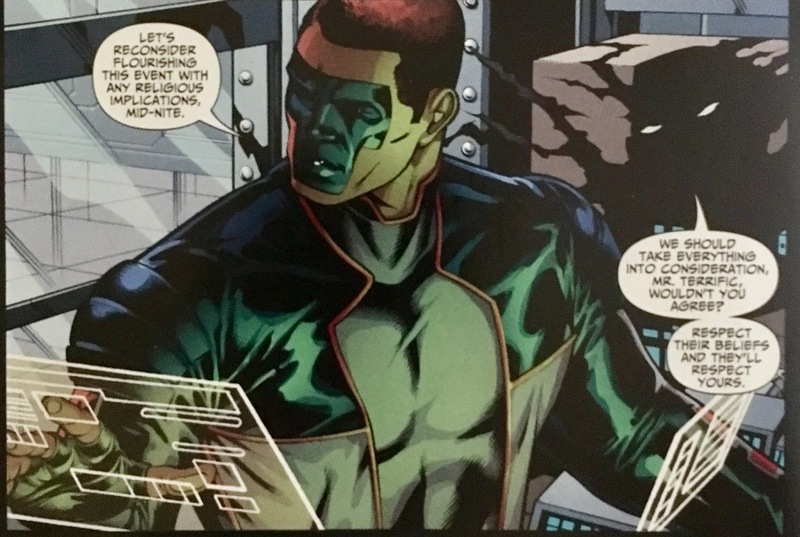 Clearly, being an Atheist/Agnostic, Holt wouldn't want issues of faith being brought in to confound his theories... which, if we take ourselves out of comic books where Gods regularly visit the the mortal realm, makes a bit more sense. What Michael said didn't come with any vitriol, scorn, or superior tone, it was just a statement. I also appreciate Obsidian imploring him to respect the beliefs of others, so that they will respect his. Without digging too deep, something tells me this scene would've been written a bit differently had this issue been released in 2017... or by Marvel. I mentioned the art during the synopsis... but, man it's ridiculously good. 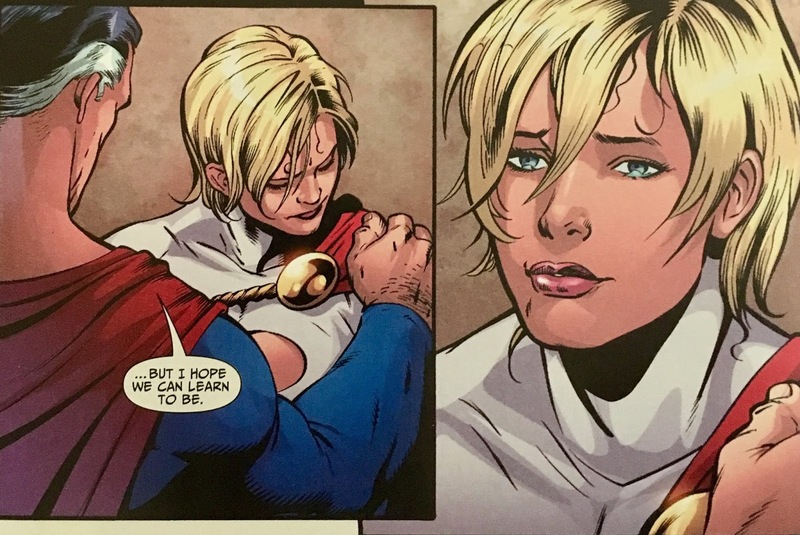 That one panel of Power Girl where she's somewhere between smiling and bawling... just so damn powerful. Dale Eaglesham is a true master, and brings so much to this book and these iconic characters. I know it'll never happen, but if/when we ever get our JSA Rebirth comic... a Johns/Eaglesham team... even for just the opening arc. Maaaan. Another JSA book I wholeheartedly recommend. 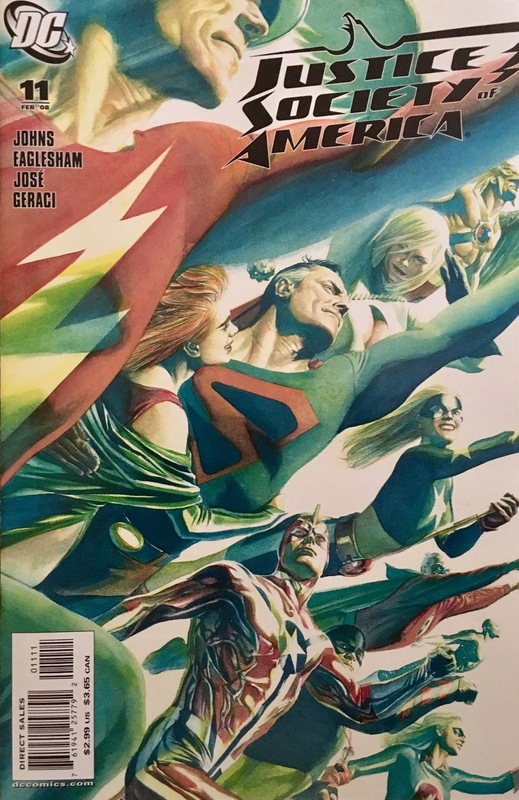 Besides a missed opportunity between the Supermen, I was more than pleased with what this issue gave us. Wonderful writing, amazing art, awesome characters... what more could a fan want? I'd love a Zuda coffee cup!